The Hawaii Police Athletic Federation fundraisers in recent years have mainly covered scholarships and donations to county police department programs, such as DARE (Drug Abuse Resistance Education). Fifth-graders from across the island take a pledge to resist drugs and violence as part of the annual DARE DAY. 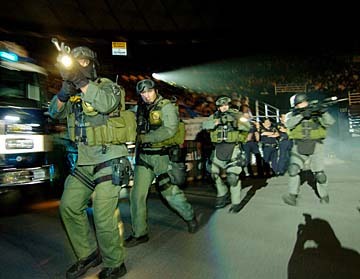 In 2005, the program included a demonstration by the Honolulu Police Department Specialized Services Division. Question: I have been receiving several phone calls and now a letter asking for a donation for the Hawaii Police Athletic Federation. Can you please tell me if this is a legitimate organization or is this another scam? I've Googled this organization and I can't find any information regarding it. One call came from a Nevada telephone number. Answer: The Hawaii Police Athletic Federation was incorporated in 1979 as the nonprofit Hawaii Police Athletic Club, changing to its current name in 1993. It is made up of active and retired county, state and federal law enforcement officers, their spouses and civilian employees, but is not affiliated with any of the four county police departments. Fundraisers in recent years have mainly covered scholarships and donations to county police department programs, such as DARE (Drug Abuse Resistance Education). Yours is the second inquiry about telemarketing calls on behalf of the athletic federation, giving us an opportunity to let readers know how they can find out if a charity and its funds solicitor are registered to do business in Hawaii and, if so, how the money raised is spent. One relatively new way is via the state attorney general's Web site, www.hawaii.gov/ag/charities. Professional solicitors are required to register with the Attorney General's Office and pay a $25,000 surety bond "to protect donors and the charity," said Hugh Jones, supervising deputy attorney general who oversees charitable solicitors and Hawaii charities. Solicitors also are required to file a financial report after the conclusion of a fundraising campaign so donors can find out how much a charity actually receives. "This (kind of) information is being collected by our office because the state cannot compel the solicitor to disclose (because of the First Amendment) what percentage the charity is going to receive" when making a solicitation, he said. However, "we can collect these financial reports and make them available on our Internet site so you can make an informed decision on whether you wish to give or not," he said. Jones explained that nonprofit organizations like the federation must register with the state Department of Commerce and Consumer Affairs, providing an annual statement of their officers and directors, but "nothing more." At one time, charities that solicit funds from the public had to register with the department and provide certain financial information, but that requirement was repealed by the Legislature in 1996, he said. The Attorney General's Office took over the registration of charity solicitors in 2005. Meanwhile, Jones pointed out that under the Better Business Bureau's charity standards, the recommendation is that no more than 35 percent be spent on fundraising expenses. Another resource, Jones said, is Guidestar (www.guidestar.org), which describes itself as the leading source of information on nonprofit organizations in the U.S., with "a searchable database of more than 1.5 million IRS-recognized nonprofit organizations." The Hawaii Police Athletic Federation is among the tax-exempt 501(c)(3) nonprofits found. "We definitely are legitimate," said federation treasurer Gordon Lee, a retired captain in the Honolulu Police Department. The out-of-state call you received was made by an employee-in-training who was using his personal cell phone with a Nevada number, Lee said. "He has been informed not to do so in the future." The federation's purpose is to "provide scholarship grants and financial aid to nonprofit organizations, including federal, state and local law enforcement agencies, (and) support amateur sports events." There currently are 99 members, down from more than 300 in the 1980s when the organization was active, Lee said. Its first attempt to raise funds for scholarships and charitable grants was a basketball game between police officers and NFL players, set up as part of the Pro Bowl in 1992. Celebrity Sports Challenge was first contracted to put on the games, followed by Athletes Helping Kids in 1997, Lee said. But the event was discontinued because of mounting expenses, and the federation switched to putting out a crime prevention and safety manual. In its last tax filing with the IRS, covering July 2005 to June 2006, the Hawaii Police Athletic Federation reported raising $52,120 through its former fundraiser, Public Safety Production Services, which received $39,090 in expenses. During that period, it gave 18 scholarships totaling $16,400 and five grants totaling $650 -- $250 to the Maui Police Department and $100 each to Little Saints Cheerleading Squad, Sisters of Notre Dame, Muscular Dystrophy and the Police Unity Tour. Anyone may apply for a scholarship, but preference is given to children of members, Lee said. He said one grant was given to a Molokai student whose parents were not members. "We have a simple one-page application that is available upon request," Lee said. Call 735-5148. Scholarships and grants are given out according to how much is raised in any given year. The federation hired MJ888M on a one-year trial basis in hopes of raising more money, Lee said. If it can raise $30,000 or $40,000 this year, the Hawaii Police Athletic Federation will be able to fund all the scholarships, plus give grants to each county police department, he said. Since 1992, it has given 139 scholarships totaling more than $134,000, Lee said. Hawaii County Assistant Police Chief Paul Ferreira confirmed receiving $1,000 checks in 2003 and 2005. Canceled checks provided by Lee also showed additional donations totaling $1,500. A total of $6,000 was donated to the Maui County Police Department between 1998 and 2005, earmarked for DARE programs on Maui. A total of $5,000 was donated to the Kauai Police Department between 1998 and 2005 and earmarked for the Explorer, Clouds or Police Activities League programs. The Honolulu Police Department received donations of $1,000 in 2003 and 2005 that did not note any specific program. It received a total of $12,500 between 1998 and 2002 made out specifically to Kick Start Karate, described by former HPD Chief Lee Donohue, a co-founder, as an educational guidance program run out of the Honolulu Police Academy. A total of $1,000 was donated in 2000 and 2001 to the Honolulu Police Community Foundation. The Hawaii Police Athletic Federation also donated $16,500 to HPD's DARE program in 1992-95, Lee said. Lee also provided canceled checks showing donations to Special Olympics Hawaii totaling $8,000 between 1998 and 2002, and a notation that $21,500 was donated between 1993 and 1997. However, Special Olympics has not received money from HPAF "for a long, long time," said Chief Executive Officer Nancy Bottelo. Is the charity for real?